The Christmas season is in full swing here in Germany. With the opening of the Weihnachtsmärkte (pronounced Vi-nachts-mairkt-uh, or in English Christmas markets) a little over a week ago, Christmas cheer is everywhere. Each town, no matter the size, has at least one, if not more, Weihnachtsmärkte, they are not only a tradition, but a staple of the time leading up to Christmas. And most Germans we have talked with are shocked, absolutely shocked, that there aren't really Christmas markets in the US. In talking with coworkers, other expats, and some German friends we are making, we have discovered that while there are a lot of similarities between Christmas here and in the US, there are also a lot of differences. So, without further ado, 10 differences between Christmas in Germany and Christmas in the US. This has already been stated, but the Christmas markets. Where in the US does an entire little village set up for an entire month, for the sole purpose of spreading Christmas cheer in little mugs of hot Gluhwein? Yea, not many places. Saint Nicholas visits on the night of December 6 and leaves little presents, candy and nuts in children's shoes. This tradition is becoming more popular in the US, but is even bigger in Europe. Historically, all presents used to be given by Saint Nicholas on December 6, but during the Protestant Reformation, Martin Luther did not agree with the celebration of gift giving in connection with a Catholic saint. Christmas eve is generally celebrated with immediate family. First and Second Christmas Days (the 25th and 26th), both of which are public holidays in Germany (read: nothing is open), are the days in which people celebrate Christmas with extended family members. Germany as a whole tends to be more religious about this holiday than the US. This is evident from the fact that you don't see the German equivalent of ''Happy Holidays'' anywhere. It's all Frohe Weihnachten (Merry Christmas). From what I understand, a lot of Muslim families in Germany even celebrate Weihnacht. Advent wreaths are popular. Each week at the market, and at every florist, there are lots of Advent wreaths. Many traditional German families gather each Sunday to light the next candle and sing Christmas carols. The Advent Calendar was pretty much invented in Germany. At first, it was just a way for children to count down the days to Christmas. Today, they are much more elaborate. They are typically made out of cardboard with little doors for each day. Behind the doors are often treats, candy or small toys (just like in the US). From our perspective, Christmas seems to be less about buying gifts and more about spending time with family in Germany. That's not to say that aren't Christmas sales, and that the Christmas decorations start arriving in the store come the middle of October (right after the Oktoberfests are done, as a matter of fact), because there are. But from what we have seen, the commercialism and consumerism isn't as big here as it is in the US. Christmas eve isn't a national holiday. The first and second Christmas days are, but not Christmas eve (which I found surprising). Shops usually close early, but they are open for a portion of the day. 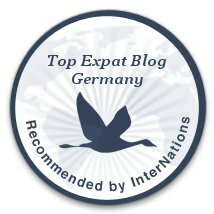 Although, in the US, many malls are open until 6, or even later, to let those procrastinators buy gifts (see #8 for comments on the German focus on family). Fruitcake is also a German invention. It is said to have first been baked in Dresden in the 14th century. Here, Stollen is easy to find in the local bakeries as well as the Christmas markets. We have not tried it yet, but we plan to! So there you have it, 10 things about Christmas in Deutschland (and a picture of Aaron for once)! Now, there are a lot more traditions, more similarities, and even more, subtle, differences between the way Christmas is celebrated in the US and Germany, but these are pretty much the big ones. However, if there's something you noticed about Christmas in Germany, or even something that you feel like sharing, put it in the comments! We love to learn about German traditions (and hear from you)!